Ever had one of those weeks that felt like you were scaling the Cliffs of Insanity? At this point, it was too big to spread out on the windowseat, so I just arranged it on the floor and snapped quickly. I’d begun a bit of the shaping around the waistline, where the pattern directs you to decrease a few stitches, then work a couple inches in the decreased amount before increasing a few stitches again. 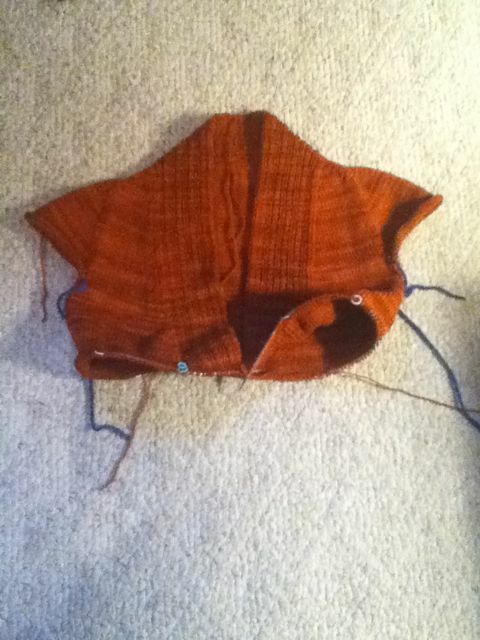 It was a landmark week because it was the first time I could try on the sweater and check the progress that way. This week? I had a couple of epiphanies about my progress: it’s progress, but I would not be finishing this sweater in the same month I started it. I’m feeling pretty excited about the possibility of wearing this lovely thing on Halloween, but we’re not done yet. That said, I took a step back and forced myself to not work on it every day; take a break; work on my climb up the Cliffs of Insanity and take care of the other bits of life for a while, and come back when I felt like I had a little room in my bursting brain to enjoy it. So, so, so close to finishing the body now! 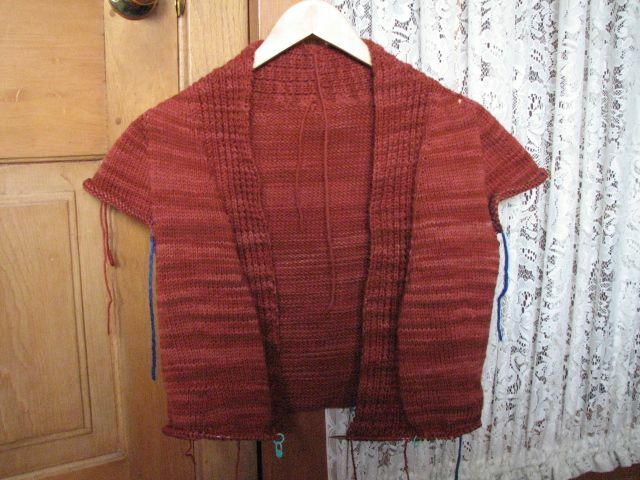 The waist shaping is done, and I have about 4.5 inches of the pattern to add before doing a little ribbing on the edge to finish it off; but we’re done with the increases, decreases, shaping the v-neck, and it’s just knitting. The only markers are where the button band ends and the body stitching begins, so we dropped about six markers as the waist shaping ended.